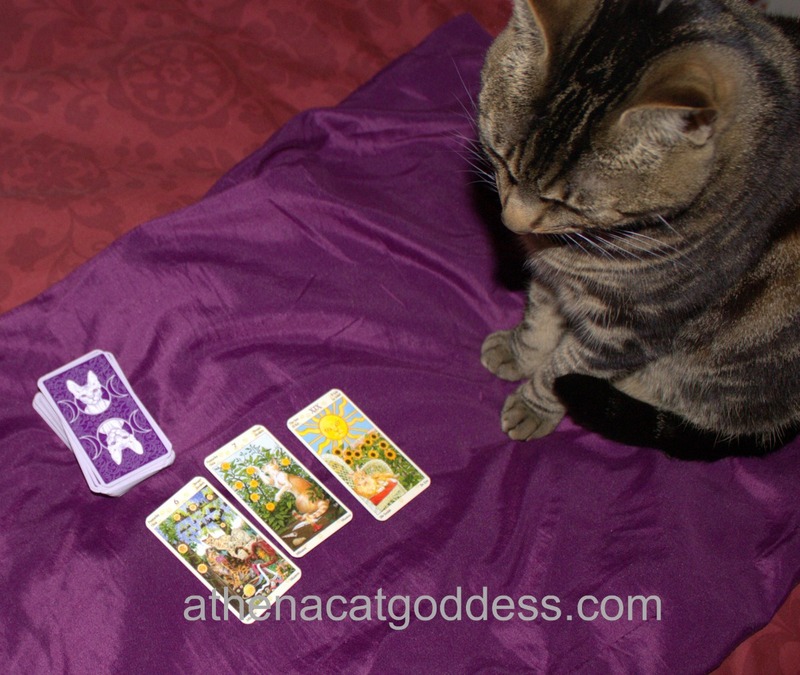 If you may remember a couple of weeks ago we had the first Pet Tarot Reading Giveaway. Well, today we are going to post the reading! This month's winner, The Island Cats, has very kindly given permission for us to post the reading for you all to enjoy. The reading was for lovely Wally. 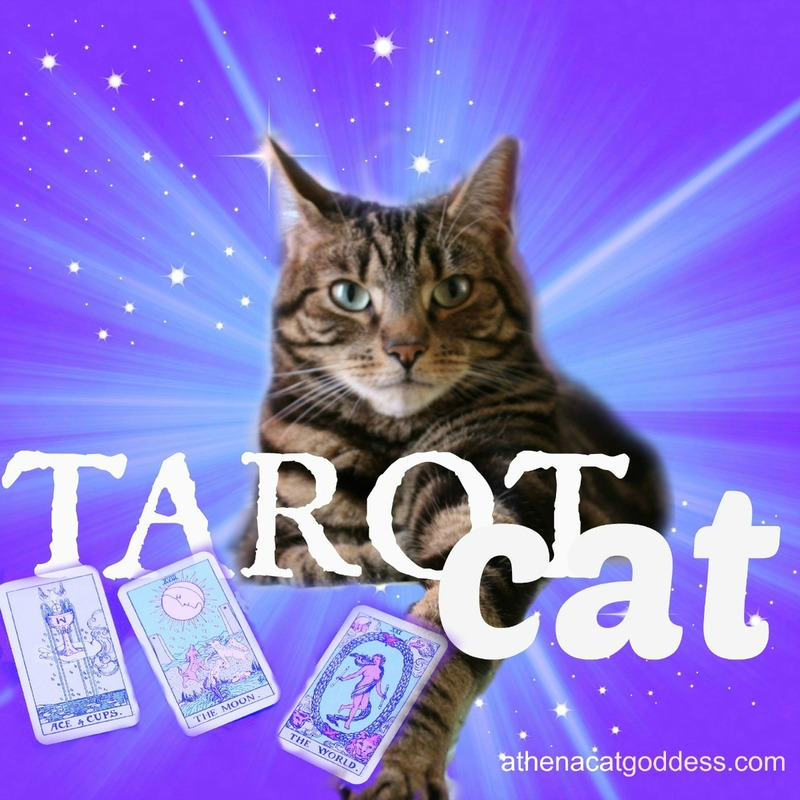 So sit back and enjoy and don't forget to join us for the next monthly Pet Tarot giveaway. The first card drawn is the KNAVE OF SWORDS. This suggest that Wally was a kitten with very wise thoughts. He seeks truth and as all clever kitties was and still is very curious. Strongwilled, he learned to communicate his thoughts with you pretty quickly. This mentally restless little bundle of energy is here to teach you patience. I see that many times he sends you clues about what he wants and needs.Thoughts thrown about and you not aware of them. Sometimes you pick up sometimes you do not. The birds in the cloudy sky in the card relate to higher spirit or spiritual thoughts. A higher consiousness. You feel he was a gift to you. Helped you in some way. Mountains represent timelessness. He is definitely a soul kitty. Eternally bound. Perhaps a past life connection. The clouds represent some fearful thoughts that he may have had as a young kitten. THE HANGED MAN suggests that in the present moment there is a sense of being a little stuck. Perhaps Wally can't go outside as often as he wants. I am getting that he is feeling frustrated in some way. "Look at things from my POV, Mom," I think he is saying. He would like you to play with him more. He finds the home slightly chaotic at times. May need more balance. Sometimes things seem indecisive. If not then he is wanting you to take a break. Give him more attention (I know, what cat doesn't want attention?) He also feels a bit controlled in some way. Maybe by other cats? I think he would like more freedom to do what he wants. He is certainly a cat that knows what he wants. 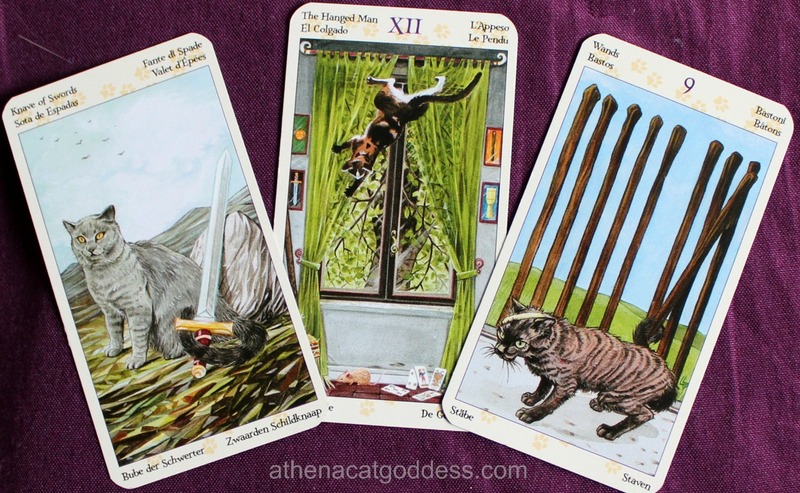 THE 9 OF WANDS in this position also relates to the present.This card is a battle or conflict card. Wally is a wise cat. Experienced many lifetimes and many with you and is dedicated to you. But he remembers old wounds, not any you have inflicted, though! Although maybe his pride has been hurt too somewhere. But he would rather forget and knows that life is to be enjoyed in the now. Playtime and treats, as well as long lovely naps is the way to go! He shows great courage and will stand his ground. Very territorial. Either he fights for the food bowl or with other cats in the neighbourhood. Other cats may seem a threat. He seems protective of you. To me, this card also suggest that he would like more of the same food and he isn't getting it! To sum up, Wally's reading shows me he is an old soul, quite the philosopher cat, who always knows what he wants and is trying to get your attention in more ways than one. He is proud and mentally strong. A handsome cat and he knows it! Thank you for letting me read for Wally. I bet Wally is feeling stuck because of all the snow they are getting! Wow, that was some interesting stuff! We don't know if Wally gets to go outside when the weather is nice, but right now, he's probably STUCK inside because it is so cold and snowy. Super cool! I was gonna make a joke about being stuck but Summer beat me to it! He is stuck in the snow for sure! MOL! Great reading. I can't wait until next month to enter the giveaway. Wally's reading was so interesting, we are so glad you were able to share it. Fantastic reading. Thank you so much for sharing.